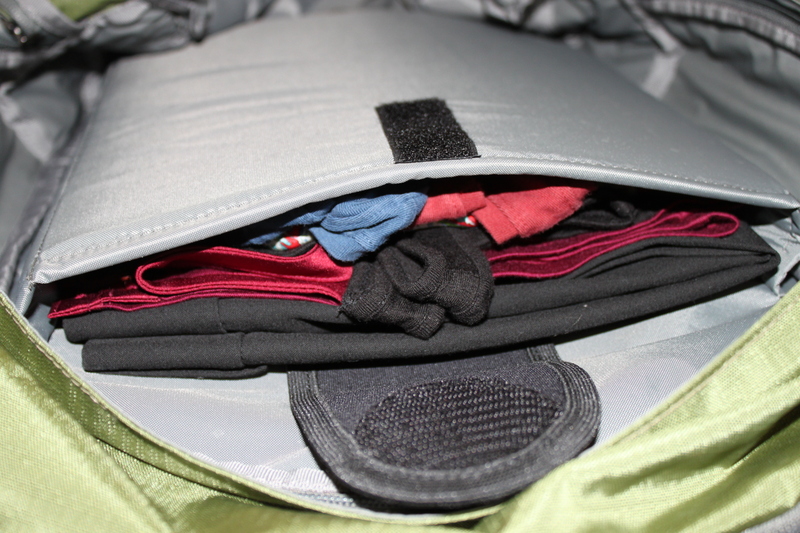 Packing Tip — Use a laptop sleeve for wrinkle-free clothes. If you’re traveling for just a few days, consider using a laptop bag as your luggage. The sleeve area keeps clothes secure and wrinkle-free. I tried this on a recent two-nighter, for which I needed nice slacks. They arrived perfect and I didn’t even need to iron. In some cases you might end up with creases where the folds are, but in this case it was fine. I always love to find new packing hacks. Do you have any? Please share! There’s plenty of advice online about how to carry money — credit card versus ATM card versus traveler’s checks versus cash. That’s not what this is about. I’m going to assume that no matter what, you’ll be carrying some cash. And if you’re going to another country, you’ll be changing at least some of that cash into the local currency. So I was totally unprepared for the Malawi Kwacha. 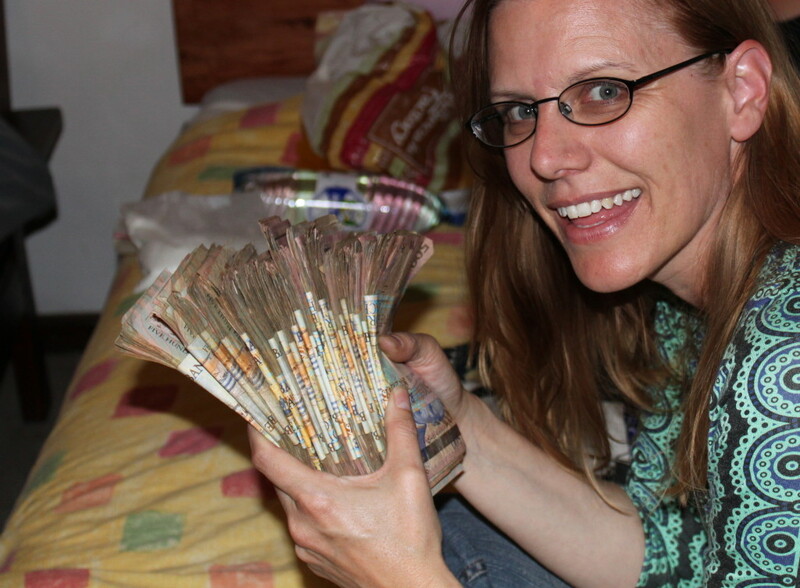 When I traveled to Malawi in 2010, the exchange rate was roughly 150 Kwacha to 1 U.S. Dollar. When we first arrived in the country, I wanted to change $300. I handed over three thin and crisp $100 bills, which of course had fit nicely in the slot of my money pouch — the place I’d designated for dollar bills. What I got in return was this pile of cash. My pathetic little money pouch was no match. Throughout the trip I had bills stuffed in so many different pockets and zippered compartments of my luggage and day pack I could never really get a feel for how much money I had on me at any given time. Do some exchange rate math before you leave home. Leave some space for a pile of cash. How do you carry money? And what do you do with a stack of bills when you’re traveling and trying NOT to look like you’re carrying a stack of bills? Baggage Fees Are Out of Control – so pack light! Yet another reason to travel as light as possible. See this article from last Sunday’s Los Angeles Times travel section (click the link above). Wear your heaviest shoes on the plane. Resist the temptation to pack just-in-case items. You can always buy it if you need it, but you probably won’t even need it. Don’t keep adding items to your bag just because there’s still space. Many of the fees are based on bag weight. Leave bulky sweaters at home and pack layers (unless you’re going to the snow). Leave as many grooming products at home as you can. Your face/hair/whatever will survive. Take items that serve double-duty — a sarong that can function as a light wrap, picnic blanket or makeshift towel as needed. Consider doing laundry on the road, so you can bring fewer pieces of clothing. 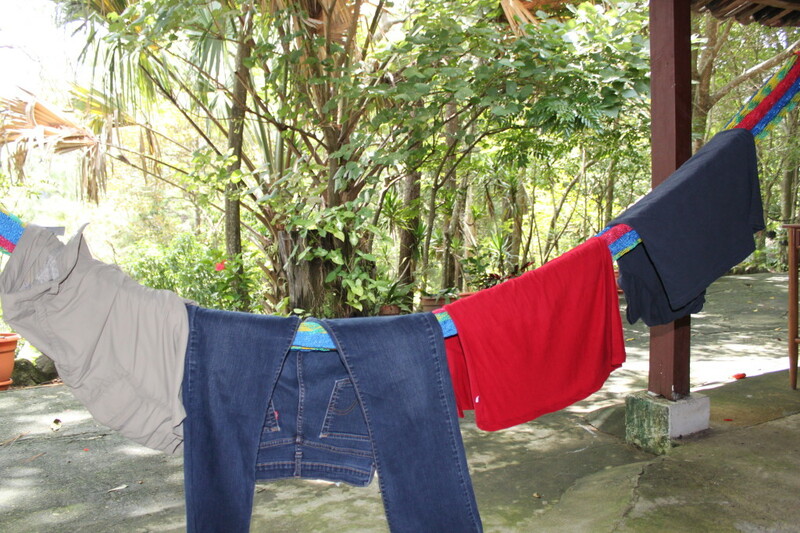 Doing laundry in El Salvador. In either case, enjoy! And please share your own tips here in the comments. Ok, even I’ll admit it can be hard to pack light when preparing to camp in the cold (and possible rain!). Should You Buy ‘Travel Clothes’? I have a love-hate relationship with travel clothes. See if you can find the hidden tourist in this photo. They look dorky (see photo as exhibit A). If you don’t wear them at home, they get limited use. They come with lots of pockets. My opinion: only on a few key items. and a UPF 30 hat. The shirt and hat are good for keeping off the sun (it’s cooler – temperature-wise – to cover your skin rather than wear a tank top). Plus, when you’re traveling at different latitudes than you’re used to, you’ll be amazed how fast you burn. Both of those items come in handy even when I’m not traveling. I sometimes use the shirt as a light cover when the sun is beating down, when walking around town or hiking here in Southern California. For other items in the travel wardrobe, I go cheap. For a light jacket I have a white exercise zip-up (polyester/spandex mix) that I bought at Target. It packs light, doesn’t wrinkle and dries fast. I also have a t-shirt from Target that wicks moisture from the body – again, dries fast and was much cheaper than a “travel” shirt. I supplement those items with articles from my normal wardrobe – a few cotton t-shirts, a pair of sturdy khakis, etc. I don’t need my entire travel wardrobe to be quick-drying – just a few items so I can wash them as I go and always have a clean option on the horizon (this is partly psychological… don’t underestimate the joy of a clean shirt on the road). Aside from the items specific to travel, I do tend to buy things from REI simply because I like them – so I have some hoodies that are made for outdoor activity. But that’s only because I am magnetically drawn to hoodies and seem to be subconsciously cultivating a master collection. They’re not necessarily for travel (even if that’s how I originally justified the purchase). What about you? Do you buy “travel clothes”? I like to travel carry-on only, and that became more difficult with TSA’s liquid limitations. The verdict? The wipe-on sunscreen and insect repellant were hits. The hand wipes, likewise. The shampoo and laundry detergent — awful. My hair never got clean, and I’ve got greasy-head-look in all of my pictures. Live and learn. I still go carry-on, I just try to ration my liquids as much as possible. 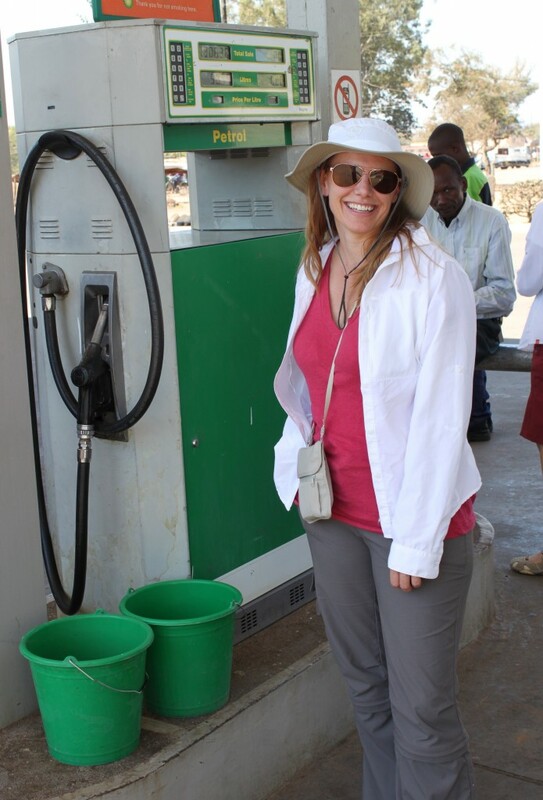 Do you have any tips for reducing liquids when you travel? Please share! Eight people, one van, two weeks. Traveling light is not just more convenient for you, it’s more convenient for the others who might be sharing your transportation. And it’s especially convenient for the gracious soul whose job it is to pack the van. Thank you, Luzu! Our faithful guide and friend in Malawi. 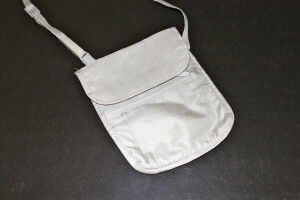 If ever there were a niche that I wish I’d thought of earlier, it’s the one found here: www.onebag.com. 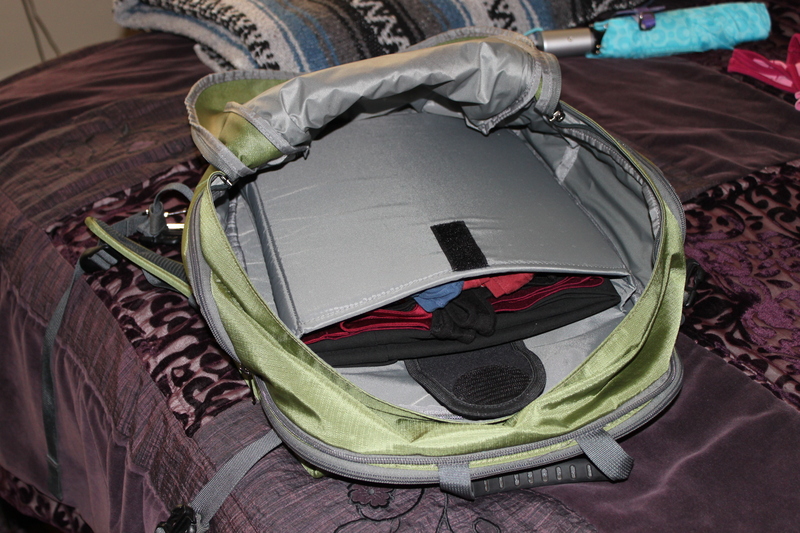 One of my favorite websites on packing light. I’m jealous that someone else thought of it first. I discovered his site years ago, and have been obsessed ever since. I am fascinated with efficient packing. As a kid I was in awe of soldiers because they carried everything they needed on their body – every essential tucked into a perfectly placed pocket. Those who’ve traveled with me (or simply know me) have heard me rhapsodize on the beauty of carry-on-only travel. Now that the airlines are charging for checked bags, I see that many more people are – perhaps reluctantly – discovering the joys of traveling light. 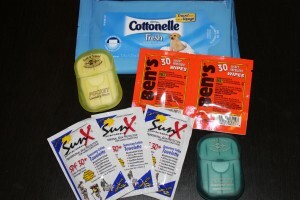 Anyway, for tips, packing lists and just plain good sense, visit www.onebag.com. And no, I am not getting anything for this endorsement beyond the hope that a larger audience will help Doug keep his site running so I can continue to stalk it.